Looking for a light, romantic story about Hollywood? Well, it's not this book. How about a wild thriller about a serial killer? That's not this book either--at least, not exactly. 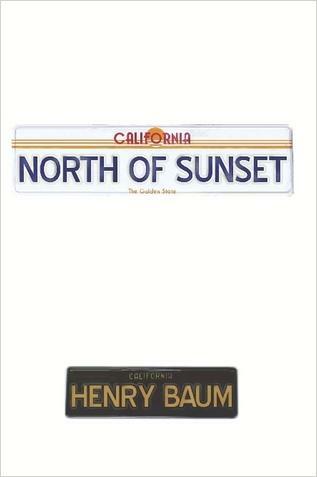 Henry Baum's NORTH OF SUNSET is the story of Michael Sennet, Hollywood heartthrob and egomaniac. It is also the story of the Vanity Plate Killer, a sociopath who is wiping out all the ladies who have personalized license plates in the greater Los Angeles area. But most of all, it is the story of how these very separate worlds collide. You are thrust into an angry Los Angeles by way of an insider's view of Hollywood, where the bowels of the movie industry are potentially worse than the world of a serial killer. He never wanted to get a regular job, at all costs. Regular jobs were for regular people. People who lacked imagination. Michael had too much imagination; he wanted to become a thousand people. He's also managed to capture all of the angst that Hollywood has riddled through its collective personality: the abusive agents, the jockeying for position, and the everyone-is-stepping-on-everyone mentality that surfaces on a daily basis. There is no doubt Baum has lived within (or permeated) this incestuous community. The writing is stellar--and I'm not just saying that because I finished reading 121 crappy books in a row. There are probably a whole bunch of influences here: Bukowski, Chandler, and of course the mandatory reference to Chuck Palahniuk. But once you've finished reading this book, I think you'll agree it is not so much who influenced the writing; it is who this writing will influence. Trust me when I say that this book is one you buy and one you keep; you'll be looking to re-read it sooner than later. Don't loan it to you friends. Go make them get their own copy. Grab it for $16.82 on Amazon or $12.95 over at Lulu. A few post-holiday goodies . . . .